Cur-OST EQ Stomach Complete Stomach and Hindgut Protection! Soothes, moisturizes, and Supports Healing of Stomach, Hindgut and Respiratory Tract Tissues with High levels of Marshmallow and Aloe. Reduces the impact of stress on the GI tract! Cur-OST EQ Stomach Soothes, Moisturizes, and Supports healing of the stomach, hindgut, and respiratory tract with high levels of Marshmallow and Aloe. Reduces the impact of stress, improves behavior. The ingredients your horse needs, focused to deliver results. Don’t just rely on antacids! Get to the root of the problem and support healing naturally! Cur-OST EQ Stomach combines the research and clinically proven abilities of Marshmallow and Aloe in high levels to soothe and moisturize the stomach, hindgut, respiratory tract and provide beneficial healing support. Stomach ulcers, hindgut ulcers, and digestive upset are a common occurrence, especially in the competition horse. Clinical signs can include signs of colic, but more often result in changes in behavior, with irritability, training difficulties, appetite fluctuations and even grooming concerns. Cur-OST EQ Stomach helps to resolve these concerns quickly and naturally! 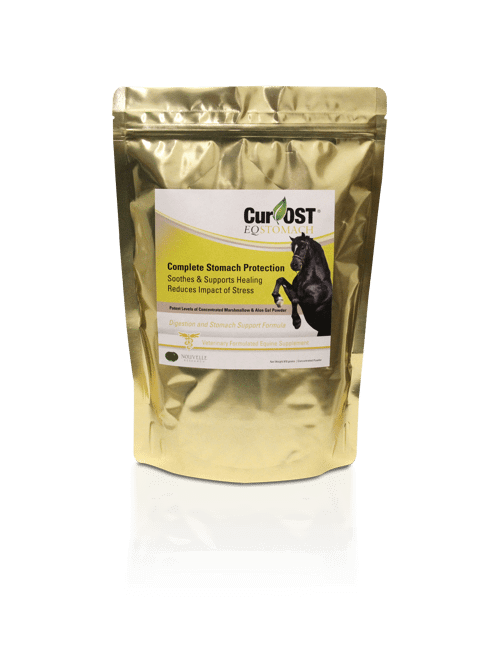 Cur-OST EQ Stomach combines the research supported and clinically proven benefits of Marshmallow and a concentrated Aloe Powder blend to get results for your horse. Marshmallow and Aloe are common ingredients found in many horse stomach formulas, but are often combined at low levels with other secondary nutrients, thus diluting out the effects and overall results. Cur-OST EQ Stomach utilizes the highest levels of both Marshmallow and a concentrated Aloe extract, providing 13.5 grams of each per serving with no added flavors, additives or inactive ingredients. We give you what your horse needs, nothing more and nothing less! The EQ Stomach formula has been used clinically for many years to reduce the impact of stress on the stomach, by reducing inflammation, providing a soothing effect to the stomach and beneficial healing properties. Soothe the Stomach and Promote Healing. Quickly and Effectively! Through daily use of the EQ Stomach formula, it may be possible to reduce the needs for prescription ulcer medications, while positively impacting your horse’s performance and reducing associated bad behaviors including reluctance to be brushed, irritability, moodiness and poor performance. Clinically proven formula and research tested to provide a marked improvement in over 80% of patients in less than 2 weeks ! Great used alone or in combination with one of our Curcumin based formulas to further promote a healthy inflammation response! 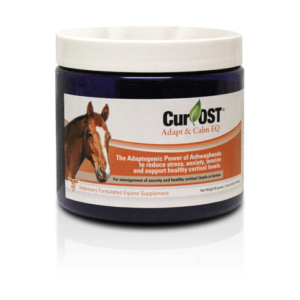 If your horse also experiences anxiety and high stress, consider adding in our EQ Adapt to reduce the impact of cortisol and stress, which can be the source of the problem! 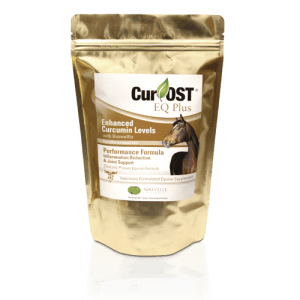 How does the EQ Stomach formula work and benefit my horse? The EQ Stomach formula utilizes critical levels of Marsmallow root and a concentrated Aloe to help moisturize, soothe and promote healing on many levels. 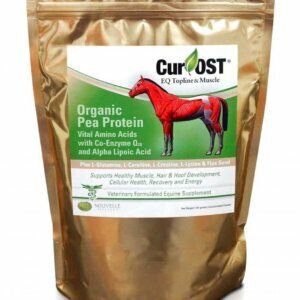 It can be very beneficial for horses that experience stomach or intestinal upset, associated with stress or other conditions. Is the EQ Stomach safe to use with other supplements and medications? Yes, the EQ Stomach is fine to use with other health or stomach supplements and even most medications, as we have not experienced any interactions, but it is generally advised to consult with your veterinarian if your horse is on a prescription medication. Is the EQ Stomach formula well accepted by most horses? Yes, the EQ Stomach formula is generally well tolerated and accepted by most horses. What else can I do to assist my horse in managing stress? In high stress situations, we often recommend using our Cur-OST® Adapt & Calm formula along with the EQ Stomach blend for best results in managing anxiety related clinical signs. Are there any banned substances in the EQ Stomach? No, there are no banned substances based on the printed list provided by the USEF or FEI. I use this formula during times of stress and hauling for all my horses. I usually start couple days before a barrel race/rodeo and continue until day after stressor is complete. My colt used to get nervous poops at a race and is now normal.